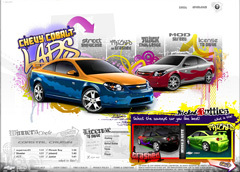 Chevy Cobalt Labs Blockdot (U.S.A.), General Motors (U.S.A.), 2009 Play it Now ! For head to head competition, this advergame races ahead of the competition. Design your own virtual Cobalt. Then challenge other online players to a race over a well crafted track. Purchase upgrades with cyber monetary units. Balance speed with accuracy for a fast time. If you are driven to win, this tricked out site was made just for you!